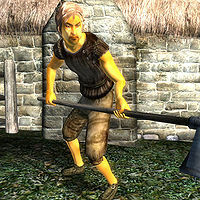 Tilmo, an Altmer commoner, is the caretaker at the Grateful Pass Stables in Skingrad. He rises every morning at 6am and spends the next two hours drifting around outside the stables. At 8am he gets out his rake, then works the land near the horses until his midday break for lunch, which he will eat on the small bench outside the stables. At 2pm, he starts wandering again, continuing until bedtime at 10pm, only interrupted by a two-hour dinner at 6pm. The one exception to this schedule occurs after his employer Ugak gra-Mogakh sells you a horse, then Tilmo will stand next to the horse until you mount it, before resuming his usual routine. Tilmo wears a pair of belted braies, a vest, and buckled shoes. He carries an iron war axe, his rake, some food, and some gold. When approached, he will quickly direct you to Ugak, who is the one in charge of selling the horses: "You need to see Ugak if you want to buy a horse. She's inside." If you buy a horse from Ugak she will send you back outside: " Tilmo has your horse waiting outside." Tilmo will then break off his schedule and wait for you outside the stables, with a horse by his side. When he sees you, he will say: "I have your horse right here." If you manage to speak to him before hearing this comment (see bugs) he will instead say: "This Bay horse will serve you well. Try to serve him just as well." Due to an odd script, only one of Tilmo's two post-purchase dialogue lines can be heard, and only once. This bug is fixed by version 3.4.0 of the Unofficial Oblivion Patch. This page was last modified on 16 January 2018, at 23:18.